Last summer, as I was planting my outdoor herb garden I came across an extra basil sapling and got a craaaaaazy idea. I would start an experiment. 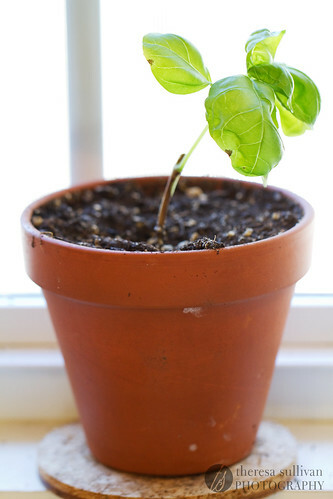 I planted the little sapling in a tiny pot on my kitchen window sill and tried not to forget to water it. It lived and grew taller and taller, like Jack’s fabled beanstalk. (Seriously, it got to be about a foot tall. The photo above was taken after I cut it down.) I knew I’d have to cut it down eventually but I didn’t want to do it until I had something worthy in mind for my magical beanstalk of basil. What goes with basil? Tomatoes. Then it hit me. Soup. Soup soup soup. I’m kind of obsessed with soup right now. I don’t usually get excited about tomato soups, but I like this one for lots of reasons. It’s got really nice depth of flavor, unlike the classic kind that comes in a red and white can. This soup can also be made dairy-free while still being rich and creamy, which my stomach is a fan of. And did I mention it’s ridiculously quick and easy to make? 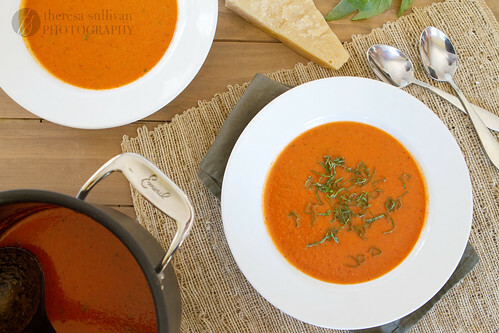 There’s something just really comforting about tomato soups, right? Pair it with a salad or some grilled cheese and eat it while wrapped up in warm a blanket for best results. Are you obsessed with soup right now too? Come join SoupaPalooza at TidyMom and Dine & Dish sponsored by KitchenAid, Red Star Yeast and Le Creuset. You’ll find 50+ soup recipes there – enough to keep you warm and comforted through the rest of winter and well into summer! Don’t get weirded out by the coconut milk. You don’t taste coconut at all, it just makes the soup creamy without the dairy. Feel free to add up to 14 ounces of coconut milk if you want your soup creamier. The wine can be omitted – I just can’t help putting wine in everything I cook. In a 2 or 3 quart stock pot over medium heat, add oil and saute shallots until soft. Add garlic, cook for 1 minute. Add wine (if using) and cook until reduced by at least half. Add tomatoes, salt and broth. Puree (using an immersion blender, or working in batches with a food processor or blender) and return to heat. Bring soup to a simmer. Stir in coconut milk. Add sugar, Parmesan and other seasoning to taste. Stir in fresh basil. Puree one last time, if desired. Serve hot. This sounds like a wonderful winter tomato soup, Those are my favorite brand of canned tomatoes and I love that it has coconut milk. I’m going to make up a batch to eat for lunch during the week! Oh wow. Fantastic – great colour and lovely contrasting garnish. Yummy. Love the tomato, basil combination in just about any form – this sounds delicious! I found you through Soupapalozza and love your soup! The only canned soup I like is that red and white canned tomato soup… its a holdover I suppose from childhood. 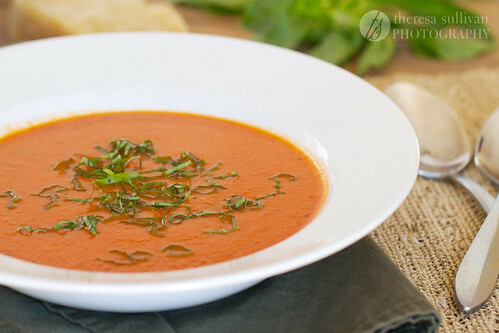 Every tomato soup recipe I’ve found usually tastes like tomato sauce, not soup. But yours looks wonderful! I pinned it and cant wait to give it a try! My daughter LOVES tomato soup, but I’ve never been brave enough to make it from scratch. (Condensed soup from a can… that’s the kind of mom I am!) This might be just the push I need! I am planning to grow lots of basil and experiment with it this year, so I’ll have to come back here once it’s growing!